PVC sheet pilling. Manufacture. Sell. Install. PVC sheet pilling is the pile with connecting locks for the building up of a solid protective wall. 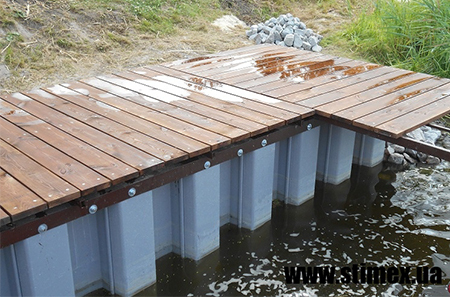 It is an analogue of Larssen steel sheet pile, but made of heavy-duty PVC (polyvinyl chloride) and is widely used in hydrotechnical and engineering construction. Possessing high mechanical resistance, it is stable to rotting, corrosion and rust, and the PVC characteristics allow to use it in aggressive environmental conditions. Banks protection. The coastline formation. Reinforcing of road slope and bridge footing. The improvement and active use coastlines of different water basins are becoming very important today. So, the main point is the coast protection: to protect banks and builds against the effects of water environment. 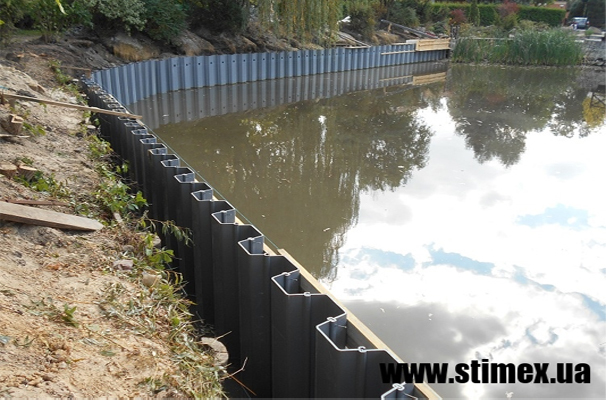 The indisputable advantages of applying vinyl sheet piling in hydraulic engineering construction are the less weight and easy installation without using of heavy equipment that reduce on 50% costs for installation as compare with steel piling, and on 75 % as compare with concrete piling. The PVC sheet piling doesn’t need additional coating and intensive care during the long period of using that can be extended to 50 years. Besides, the environmentally friendly is one of the most important advantage in applying of vinyl pilling. During the installation you can use boats, equipment based on excavators and arrows as well as independent stations with manual vibratory hammer.